The public is invited to “Horizon Lines”, a First Thursday Art Exhibit and Artist Reception, at Santa Barbara Art Works, at 28 E. Victoria St., an artist studio-gallery for adults with intellectual and/or physical disabilities to express themselves, collaborate within the community, create, exhibit and sell their artwork in a professional gallery. Santa Barbara Art Works is a sponsored business, supported by UCP WORK, Inc. a 501c3 organization. The studio specializes in art classes for adults with disabilities, which are taught five days a week in painting, ceramics, mixed media, and watercolors. Students are also taught employment skills in exhibiting and commissioning their own work, and each artist works towards producing a portfolio and an annual solo show. Santa Barbara Art Works' mission of building awareness and inclusion for people with disabilities is through their use of adaptive art techniques. For example, one resident artist with cerebral palsy uses a paintbrush attached to a mouthpiece to apply paint to his canvas. Another artist has difficulty holding a pen, so his Art Instructor supports him by developing a pen layered with a piece of foam and duct tape allowing for a much better grip. Santa Barbara Art Works is in hopes of breaking down barriers for people with disabilities so that its participants are encouraged every day and in the process of finding their voice and real jobs in the art industry. 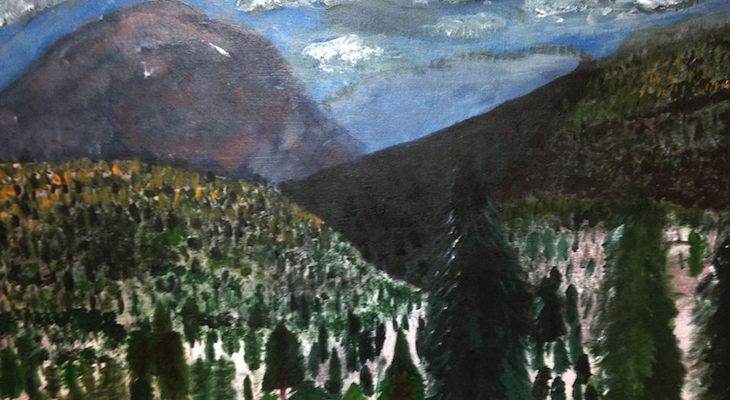 What: “Horizon Lines”, First Thursday Art Exhibit & Holiday Artist Reception, a collection of landscape paintings by the resident artists of Santa Barbara Art Works. When: Thursday, December 6th, 2018, 5:00 - 8:00 PM. Where: Santa Barbara Art Works, 28 E Victoria Street, Santa Barbara, CA. 93101. The event is Free and open to the public; Wine tasting by Melville winery and light hors-d'oeuvres will be served. Live Jazz by the Dos Pueblos Jazz Combo. Santa Barbara Art Works is part of the UCP WORK, Inc. family of services, and is a 501(c)3 nonprofit organization. 50% of the proceeds from the sales of the artwork goes directly to the artists, and the remaining funds goes towards the costs of classes and art supplies. For more information about Santa Barbara Art Works, contact info@sbartworks.org or visit http://www.sbartworks.org or http://www.facebook.com/santabarbaraartworks. About UCP WORK, Inc. is dedicated to providing services to residents of the Tri-County with mental and/or physical disabilities, so that they may work and live independently as contributing citizens within the community of their choice. A not for profit agency, UCP WORK, Inc. is dedicated to assisting people with significant disabilities grow toward productive and satisfying lives within the community of their choice. UCP WORK, Inc. is committed to being leaders in providing innovative programs to maximize employability, independence and quality of life. UCP WORK, Inc. was founded in 1968 by the Kiwanis Club of Santa Barbara. The Agency is governed by a volunteer Board of Directors and employs a staff of approximately 200 individuals to administer and provide services to over 500 program participants. UCP WORK, Inc. maintains offices in Santa Maria, Santa Barbara and Carpinteria (Santa Barbara County), and provides services throughout the Tri-County. For more information about our programs, visit http://www.ucpworkinc.org.